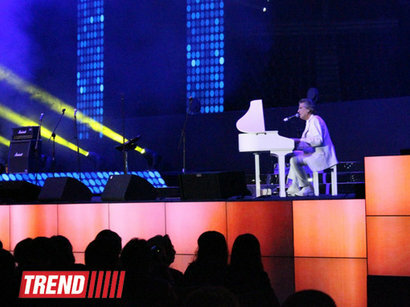 Baku witnessed the grandiose show of the legendary Sanremo festival stars in the Crystal Hall, one of the country's central halls, on December 18. Beloved Italian pop stars presented a fabulous concert program and sang all their famous songs for the first time for Azerbaijani audience. Super stars of the 80s -Al Bano, Toto Cutugno, Pupo, Riccardo Fogli, Tony Esposito, Umberto Tozzi, Maria Fiordalizo, and Ivana Spagna, as well as famous bands "Ricchi E Poveri" and "Matia Bazar" sang their catchy songs to the accompaniment of the young and mature audience. Azerbaijan's First Lady and President of the Heydar Aliyev Foundation, Mehriban Aliyeva attended the concert. Renowned Italian actress Ornella Muti and Azerbaijani show master Tural Asadov hosted the concert, organized with the support of the Heydar Aliyev Foundation. Muti, who is the beloved quest of Baku, said the city had become even more beautiful. The concert held a lot of energy with its light shows and special effects, and while the grownups were immersed in nostalgia, the youngsters danced all night long. The singers were also full of energy fueled by Baku's beauty. Passionate Italians confessed their love to the audience, expressing admiration for the capital city, its architecture that mixes East and West, and the world-known hospitality and kindness of its people. Ivana Spagna said it was her first visit to Baku. "When I went from the airport to the city, I had the feeling that I was in heaven." The pleased Baku audience did not hold back on their applause, which followed all the lovely Italian songs. Fiordalizo talked a lot about the beauty of Baku, saying she was stunned by Baku and she intended to return there shortly. The singer wished the Baku audience would love each other and live for the day. Energetic Al Bano also expressed his gratitude to Azerbaijan and thanked the audience for their warm welcome in Azerbaijani. His major hit of all times "Felicita" was greeted with a standing ovation. Marvelous singer and composer Toto Cutugno sang from his repertoire and the pieces he had composed for Adriano Celentano and Joe Dassin. Cutugno presented the audience with another surprise at the end of the evening, singing Azerbaijani folk song "Sari Gelin" in Azerbaijani, which led to a standing ovation of the all Crystal Hall's visitors. "I've been trying to learn a famous Azerbaijani song for three days. Your language is very difficult. I am trying to sing this song because I love you very much," he said. Italian song festival Sanremo is a popular Italian song contest, held annually in the city of Sanremo from 1951. The competition, which later became an inspiration for the Eurovision song contest, includes only unreleased songs.